Enjoy your time away knowing your pet is having fun with furry friends. Contact Camp Bow Wow Mt Juliet today at (615) 754-5787 to learn more. Your dog is your family – at Camp Bow Wow Mt Juliet, we understand that. As dog lovers ourselves, we take your pup’s care very seriously. That’s why we think of ourselves as so much more than just a dog boarding service. We are here to provide love and support for your furry family member while you are away—filling that gap as best we can until your return. Price is added to price of cabin/suite selected. Additional dog must stay in the same cabin or suite. Fresh and clean bath service includes shampoo, conditioner, and blow dry. Price varies based on dog size and hair length. Add on to an overnight boarding stay! 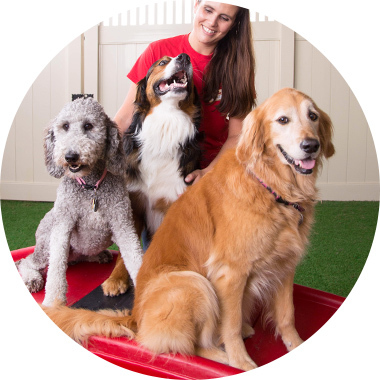 Ultimutt package includes oatmeal shampoo, conditioner, blow dry, nail trim/grind, ear cleaning, teeth cleaning, and blueberry facial in addition to bath price. Add on to an overnight boarding stay!